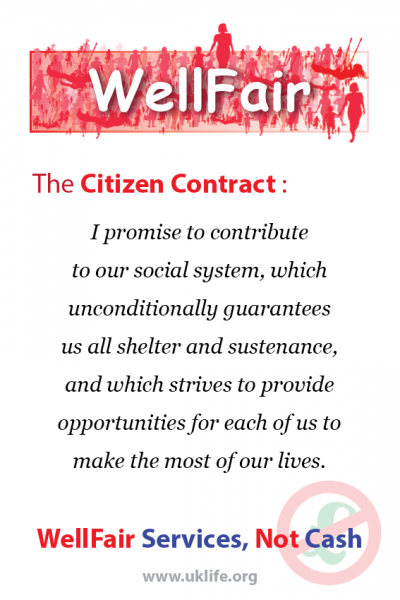 LIFE believes that society is based on a “citizen contract”, a promise between citizens to guarantee a basic standard of LIFE to everyone. Not a basic income, a basic life. Transforming our social support from cash distribution to service delivery is a centrepiece of LIFE policy. WellFair services are free, and they do not change depending on how much you earn. Got a better job? Keep your free bus pass. WellFair is NOT means tested. WellFair will transform our society from dependence to independence, from disempowerment to empowerment, and from waste to utility. The move to universal basic services liberates pent up economic demand, and makes social support affordable. All of these services will be delivered free at the point of need, and Income Taxes will be 100% dedicated to the provision of these services alone. The primary service delivery point must be local communities, in partnership with regional and national government where it makes sense. Local delivery ensures that the most effective use can be made of the available funds, that waste is minimised and provides direct accountability. To empower local communities, LIFE will revamp local government to attract the best available representatives and increase democratic control and accountability. Converting social support from cash payments to universal services makes the cost those services affordable from a reasonable tax on the wealth economy. Once the WellFair services are being delivered the restrictions on minimum wages can be removed, and the cost of delivering the services themselves will decrease. See here for our breakdown of the WellFair budget and here for the LIFE overall tax and spend budget. One of the great myths of the 20th Century was that we could value everything in terms of money. It’s not true. Our economy exists inside our society, and will never generate enough cash in taxes to “pay” for all of our social needs. Especially true with advanced demographics, with longer education and longer old age. Providing basic but comprehensive social security services, universally and without means testing, is effectively delivering a ‘living wage‘ equivalent. ‘Living wage’ equivalent social security services allow labour markets to be less regulated (no minimum wage or required contracts). This is not possible with a benefits system because minimum standards are necessarily defined in cash terms and must be purchased in the market. ‘Living wage’ equivalent social security services allow labour rates to fall without deteriorating living standards. This fall in labour rates has a recursively deflationary effect on the cost of proving the services themselves. LIFE will replace all cash benefits with universal WellFair services within 3 years. 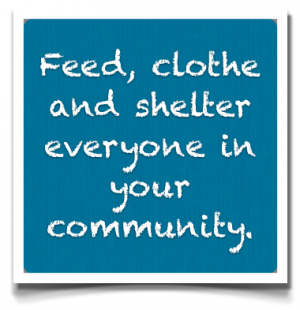 Some services (healthcare, education and legal services) are already in place; others are present but need adjustment (shelter and transport); and only sustenance and information are substantially new. The Basic State Pension will remain in place, and phased to a level that people want to afford over 10 years. “I commit to contribute to our social system, which unconditionally guarantees us all shelter and sustemance, and which strives to provide opportunities for each of us to make the most of our lives”. See the WellFair Charter for Community commitments to service quality and citizen participation. “In broad terms, I assert that modern society, acting through its Government, owes the definite obligation to prevent the starvation or the dire want of any of its fellow men and women who try to maintain themselves but cannot. To these unfortunate citizens aid must be extended by the Government — not as a matter of charity, but as a matter of social duty.” – Franklin D. Roosevelt: “Radio Address on Unemployment and Social Welfare From Albany, New York,” October 13, 1932.